There are cases where when the doors arises a need to expand the doorway. For example, when you buy or order a door. Also, this procedure can be performed in the repair of the premises for the purpose of redevelopment, changing its appearance or design in General. In addition, the reason for the extension of the opening may be buying a large piece of furniture that can't get into the room. This problem is particularly acute for residents of apartment buildings of the Soviet type. 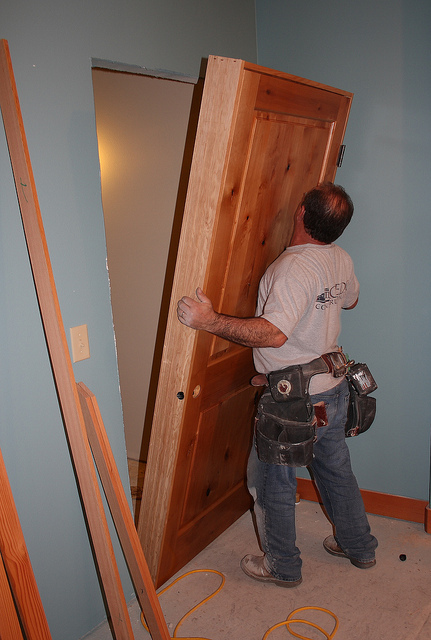 The extension of the door opening is a painstaking job which requires accuracy and professionalism. The difficulty of this work is due to a relatively high risk of destruction of the supporting structure. When performing work necessary to maintain the strength of the wall and ceiling structures, to prevent deformation of the opening and falling bricks. In connection with these reason the work is best left to professionals. Before deciding on this procedure, it is important to ensure that the load on the wall is deformed when the doorway is not exceeded. This type of work applies to housing redevelopment and therefore require formal approval by the parties of the authorities. Ie, you need to obtain documentary permission for the conversion of the doorway. For this you need to prepare a package of documents: a floor plan of the reference from BTI, an extract from the house register, etc. The distance that you can extend the opening depends on the type of walls and houses. On concrete and brick walls are allowed to cut from 70 cm to 200 cm in width and 210 cm in height. In cases when the apartment or office space is located on the lower floors, the doorway needs to be further improved. The procedure itself takes place in several stages. Before working it is necessary to remove all extraneous pieces of furniture, and covered with a protective film walls and ceiling, to avoid falling on their surface dust, dirt and water. All work on the extension of the opening begin with the dismantling of the old input or interior doors. After that, you need to carefully measure the distance by which to expand the opening. Then directly the extension of the doorway, and then remove the resulting debris and prepare the opening for installation of the new door. For quality of these activities requires a special tool and some skill. The essential point is whether the wall that undergoes changes to bearing walls or major. In addition, do not make the doorway wider than 1 meter on the lower floors of apartment and administrative buildings, as the walls in this case is an additional burden. Otherwise, the purpose of security, you need to install additional supports. The work on the extension of the opening is in two ways. The first way is to use for the removal of excess material with a sledgehammer, jackhammer or hammer drill, and the second method is a more accurate cutting of a wall using the blade with a diamond coating. In the first case, this procedure is as follows: make through holes on the planned line, and then, using a jackhammer or sledgehammer gradually taps the pieces of brick or concrete. This method is considered traditional, however, you must keep in mind that work a jackhammer or sledgehammer can contribute to the formation of microcracks on the entire surface of the wall. In addition, after the expansion of the opening in the traditional way remains uneven edge of the wall, which there is a need for sealing or the installation of the revetments. Diamond cutting is a more viable option for buildings with brick and concrete walls. The advantages of this method are sufficient. Tool for cutting discs with diamond coating, you can extend the doorway more quickly and efficiently. This tool is able to cut bricks, concrete, rebar. You can also note the low noise level no vibration and impact on the wall, which allows to preserve its integrity. With diamond cutting to smooth the edge of the wall and a clear geometric shape of the opening. It also prevents the formation of cracks and leaves no chipping. However, this procedure is accompanied by the release of dust. To avoid this, careful work diamond sharp use water: moisten the disk with some amount of water, which absorbs dust particles generated during the work. In terms of cost, the use of cutters with a diamond coating - a more expensive procedure compared to the method of extension of the opening with a sledgehammer. After the doorway expanded, you should carefully inspect the wall for cracks, chips or other defects. In case of detection of these defects, you must remove them immediately. After installation of entrance and interior doors. Door design it is advisable to purchase before doing work, making possible to perform the operation more accurately and avoid unnecessary actions.